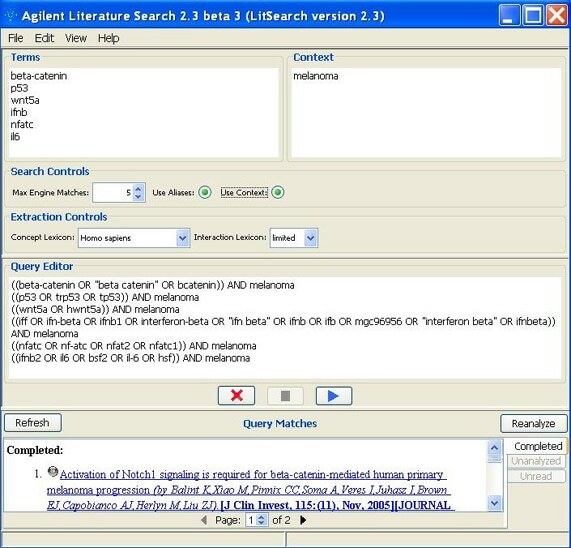 Agilent Literature Search Software is a meta-search tool for automatically querying multiple text-based search engines (both public and proprietary) in order to aid biologists faced with the daunting task of manually searching and extracting associations among genes/proteins of interest. 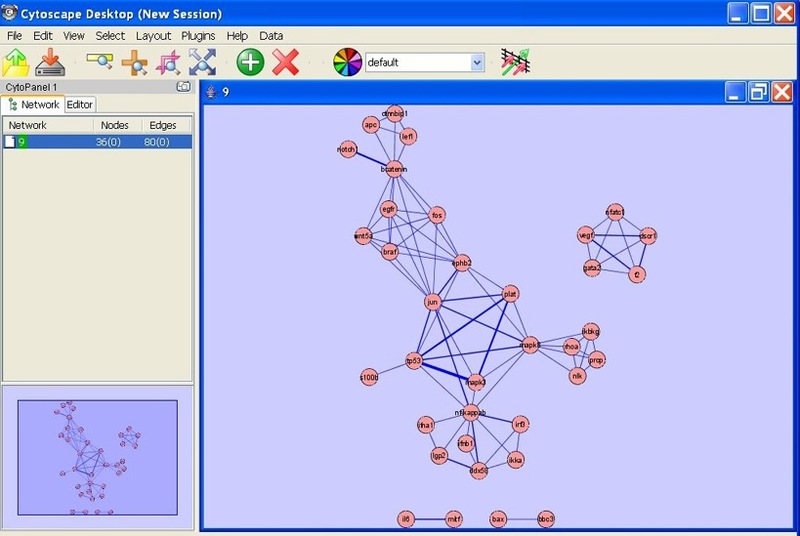 Agilent Literature Search Software can be used in conjunction with Cytoscape, which provides a means of generating an overview network view of gene/protein associations. Agilent Literature Search Software provides an easy-to-use interface to its powerful querying capabilities. When a query is entered, it is submitted to multiple user-selected search engines, and the retrieved results (documents) are fetched from their respective sources. Each document is then parsed into sentences and analyzed for protein-protein associations. Agilent Literature Search Software uses a set of "context" files (lexicons) for defining protein names (and aliases) and association terms (verbs) of interest. Associations extracted from these documents are collected into a Cytoscape network. The sentences and source hyperlinks for each association are further stored as attributes of the corresponding Cytoscape edges. Agilent Literature Search is a registered Cytoscape plugin and can be installed via the Cytoscape Plugin Manager. Just click the plugins->Manage Plugins menu item and then look under Network Inference. Click on any of the images below for a larger size. The Agilent Literature Search control panel is shown following execution of a search on a set of gene terms related to melanoma. The user has filled in query information and set options to use a Homo Sapiens concept lexicon to resolve aliases and to limit search engine "hits" to five per search engine per query line. Entries in the Query Matches panel correspond to the sentences found in the literature when that search was executed. An association is extracted for every sentence containing at least two concept names and one verb. Associations are then converted into interactions, which are further grouped into a network. The Cytoscape user interface shows the resulting network from the example of a melanoma search in Figure 1. The sentences and source hyperlinks for each association found in the literature are further stored as attributes of the corresponding nodes and edges in Cytoscape. 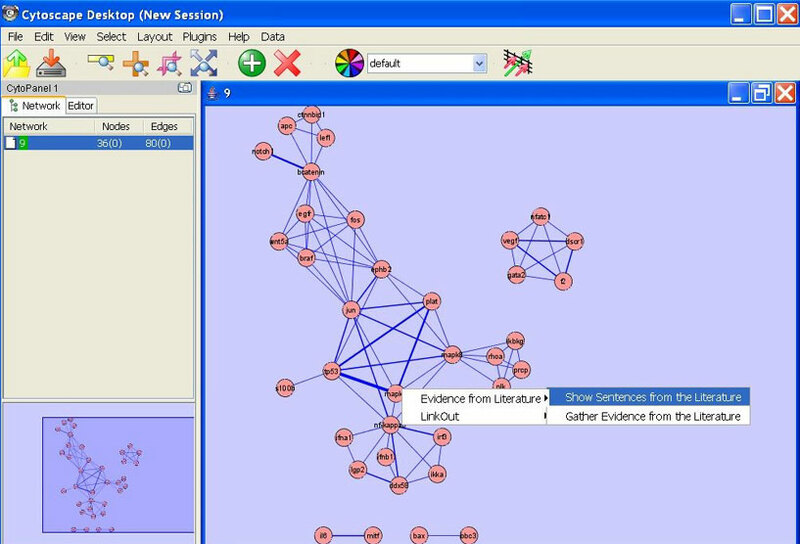 This Cytoscape context menu shows a mechanism for examining the sentences and source hyperlinks for each association, extracted by Agilent Literature Search. These have been stored as attributes of the corresponding nodes and edges in the Cytoscape netework. When users click on any node -- for example, the node corresponding to the term mapK3 from the search in Figure 1 -- they can access context areas of additional information. The Agilent Literature Search sentence panel shows the sentences accessed by clicking on "Show sentences from Agilent Literature Search" in Figure 3. Aditya Vailaya , Peter Bluvas , Robert Kincaid , Allan Kuchinsky , Michael Creech , and Annette Adler, "An architecture for biological information extraction and representation," Bioinformatics, 2005, 21(4):430-438. King JY, Ferrara R, Tabibiazar R, Spin JM, Chen MM, Kuchinsky A, Vailaya A, Kincaid R, Tsalenko A, Deng DX, Connolly A, Zhang P, Yang E, Watt C, Yakhini Z, Ben-Dor A, Adler A, Bruhn L, Tsao P, Quertermous T, Ashley EA., “Pathway analysis of coronary atherosclerosis”, Physiol Genomics. 2005 Sep 21;23(1):103-18. Ashley EA, Ferrara R, King JY, Vailaya A, Kuchinsky A, He X, Byers B, Gerckens U, Oblin S, Tsalenko A, Soito A, Spin JM, Tabibiazar R, Connolly AJ, Simpson JB, Grube E, Quertermous T. Related Articles, “Network analysis of human in-stent restenosis”, Circulation. 2006 Dec 12;114(24):2644-54.